Sky Sanctuary is the third stage in Sonic Generations for the PC, PS3, and Xbox 360. It is a remake of Sky Sanctuary Zone from Sonic & Knuckles. The stage has the bouncy clouds and teleporter beams like the original, as well as new elements such as shadowy indoor sections and indigo Missile Eggrobos. The rotating platforms from the original have been given a Dragon Road-style twist with missing sections, and the antigravity top from Marble Garden Zone has been imported to this later stage of S3&K. This level is very platforming-heavy, even in the Modern Act, and has a good deal of bottomless pits than most of the other stages in Generations. During the stage, as in 1994, the Death Egg can be seen raising into the sky in the background. Act 1 begins in a similar way to the original stage, passing through the outer parts of the sanctuary with dazzling views and anti-gravitational tops, also ending in a similar way to the original stage: the towers crumbling as the Death Egg rises. Act 2 explores beyond the exterior of these floating ruins by going within the interior, which has similarities with Hidden Palace Zone. 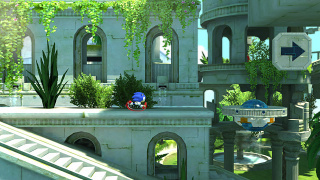 Such areas are full of obstacles that require more precise platforming. Just like in Act 1, the towers collapse at the end. The Sonics make their way to Sky Sanctuary directly after unfreezing Amy Rose at Chemical Plant. Knuckles the Echidna is unfrozen after completing Acts 1 and 2 of this zone, and remarks that "it's good to have my sanctuary back". Eggrobo - Jetpack-wearing, laser-rifle-toting, mechanical Eggmen. The traditional Eggrobos are joined in this level by a rocket-spewing variant, the Missile Eggrobo. 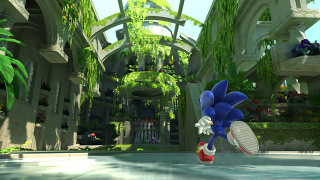 There are vines in Sky Sanctuary's area of White Space, a reference to the fact that Knuckles likes grapes.